You can’t escape Pokémon Go, much like Game of Thrones spoilers. Could anyone have ever predicted the unexpected insanity of Pokémon of all things? Not Nintendo, based on some complaints about launch initial bugs, yet their stock has surged by 30 per cent in the past two days since the game’s inception. Whether you’re a 10 year old or 30 something, the user experience of this app will more than likely enchant you. Technologically, Pokémon Go may go down in history as the app that brought augmented reality (AR) to the masses. Snapchat excited the pants off of us with filters. All of sudden everyone had a rainbow flowing from their mouth or a bunny face. In this way, Snapchat is the neanderthal version of AR in comparison to Pokémon. Despite the Pokémon app being around in beta form since September 2015, Pokémon Go’s popularity has seemingly bubbled out of nowhere. It may not be taking AR to the next level like Magic Leap, but it is real and commercially available. You can literally download it now in iOS or Android (even us Canadians). Pokémon Go is a free-to-play augmented reality mobile game that allows players to capture, battle, train, and trade virtual Pokémon who appear throughout the real world. It’s seamless. It doesn’t require a headset or even the latest and greatest phone on the market. It’s just a simple app. Location services allow you to see the virtual Pokémon, which means you actually have to move around to participate. A Bluetooth connection will notify you when a Pokémon is nearby with an LED display and light vibration. 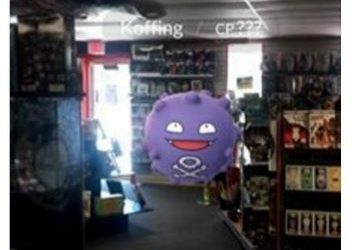 See a Pokémon? Toss a Poké ball at it to capture it, which adds it to your library of captured creatures. That’s it. The short answer is Niantic, Inc. – a software development company, and the long answer is Google. If you haven’t heard of Niantic Inc before, they’re best known for developing the augmented reality mobile games Ingress. The company was formed by John Hanke in 2010, as an internal startup at Google. It was later spun out of Google as an independent entity in October 2015, after Google’s announcement of its restructuring as Alphabet Inc. Integrating VR into wearable tech. according to the founder John Hanke, Niantic may integrate the game into other wearable devices, including their own. In this case, Google Glass may come in handy. This concept could also work amazingly on a smartwatch. Not to mention how other games could implement their own version. Imagine seeing actual zombies running around and at you on your next Zombies, Run! In the meantime for those companies smart enough to leverage the platform while it’s hot, the promotion possibilities are endless. Here’s a first mover below, but the real fruits of this labor remain to be seen. The driver vs. the car: Who's really in control?